This couple sat opposite me whilst I waited for my dentist appointment. I liked the way they comfortably shared the puzzle on her iPad. 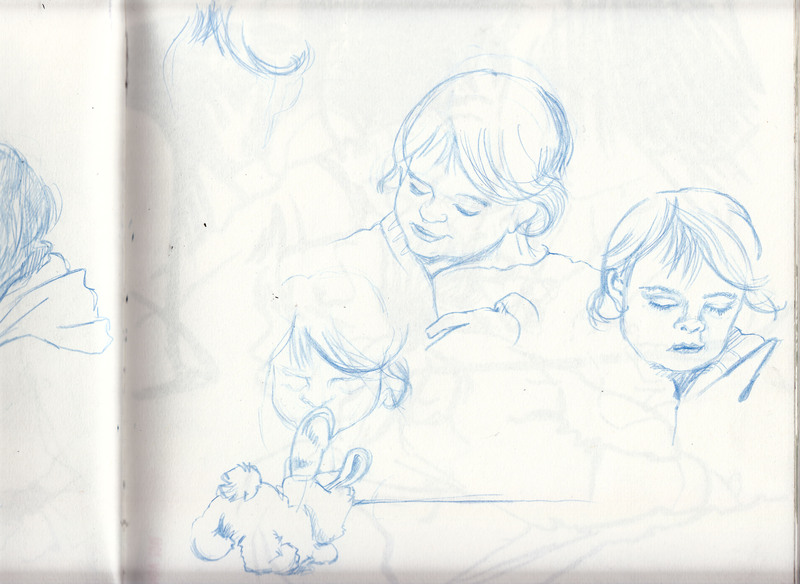 I’m a little bit more on the look out for narrative, for the ‘story’ in what I am drawing. It’s no longer enough to just start drawing stuff, any stuff – I mean that’s fine and all – but I want to be a bit more selective. Sort out the really nice moments, interesting places, dynamic angles or whatever. When I began this drawing, the first chap was called and I could have just continued to draw along the wall of waiting figures (it would look as if the people had all been sitting there together when in fact they had come and gone at different times) but that would have meant new man would have been appearing to stare into first man’s lap. That would have said something completely different (and perhaps a bit odd). Therefore I had to draw new man’s wife/sister and the way they were sharing a puzzle (looking at her iPad, not into first man’s lap). 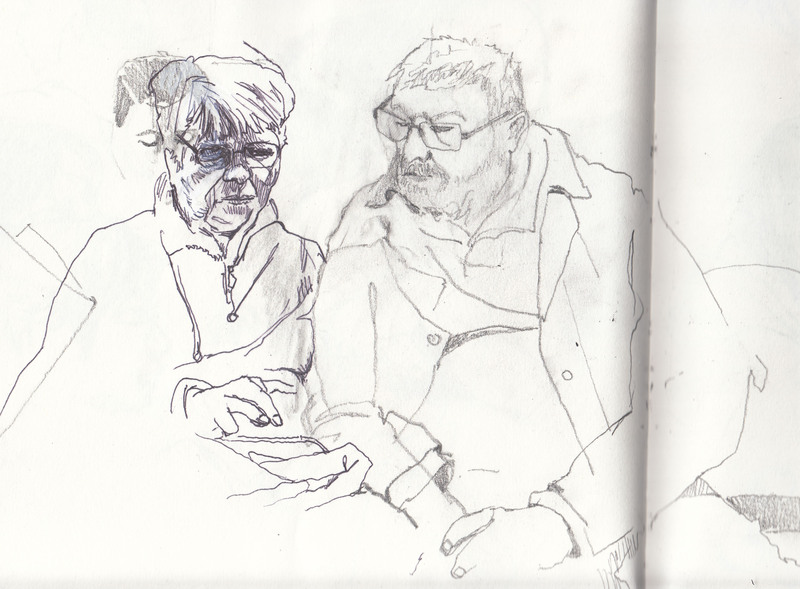 It meant having to draw over the previous man; that’s why I chose to draw her in Biro, as I planned to keep the previous man in hoping it would create a sense of the people coming and going. However to see what I was doing I had to rub a lot of first chap out. Little girl opposite me whilst I was waiting for my son to do gymnastics. I’m getting better at asking people if they mind me drawing their children. 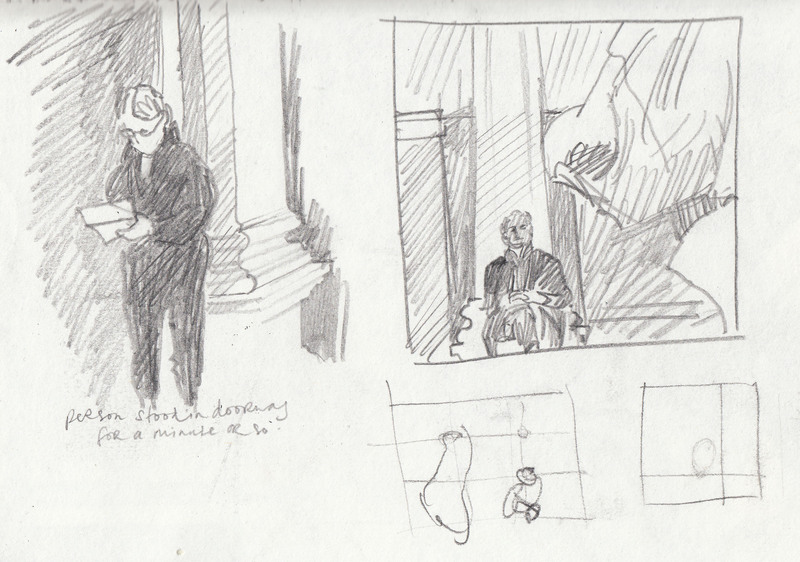 Drawing ‘on location’ with Hannah Webb and Jane Human (two of our tutors). I had some interesting feedback from most awesome ‘sketcher’ of stuff and people and places, Hannah Webb. 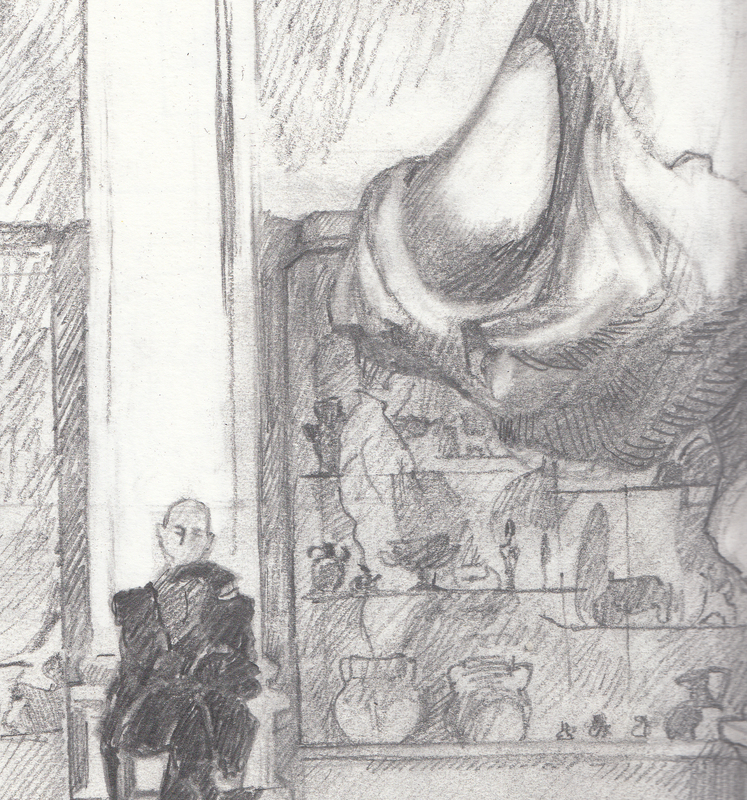 It’s maybe not better in this sketch because the thumbnail was so hurried, it kind of took liberties with actual space and made the contrast of scale more extreme. I suppose that that’s the beauty of illustration, if I was making the image up I would use the more dynamic composition (commonly referred to as Artistic Licence). You may also notice I loved drawing the shadows of all those pots in the cabinets! So on my return to Chelmsford I drew in our local museum, which although delightful and beautifully presented throughout, is not the Fitzwilliam. 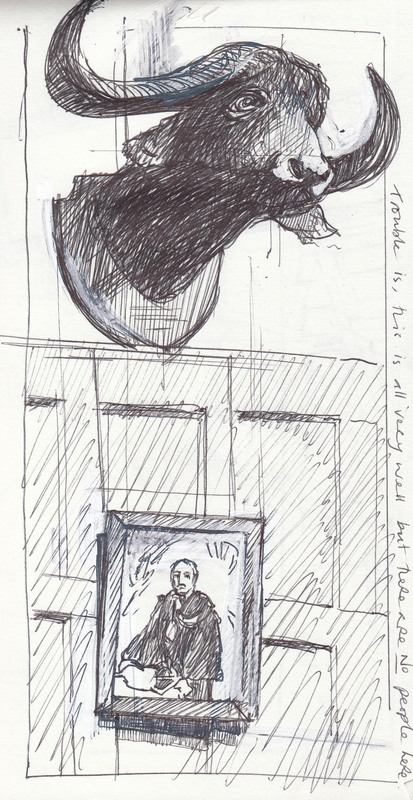 This is what I drew – there wasn’t a soul in the museum (unless you count the stuffed bear). 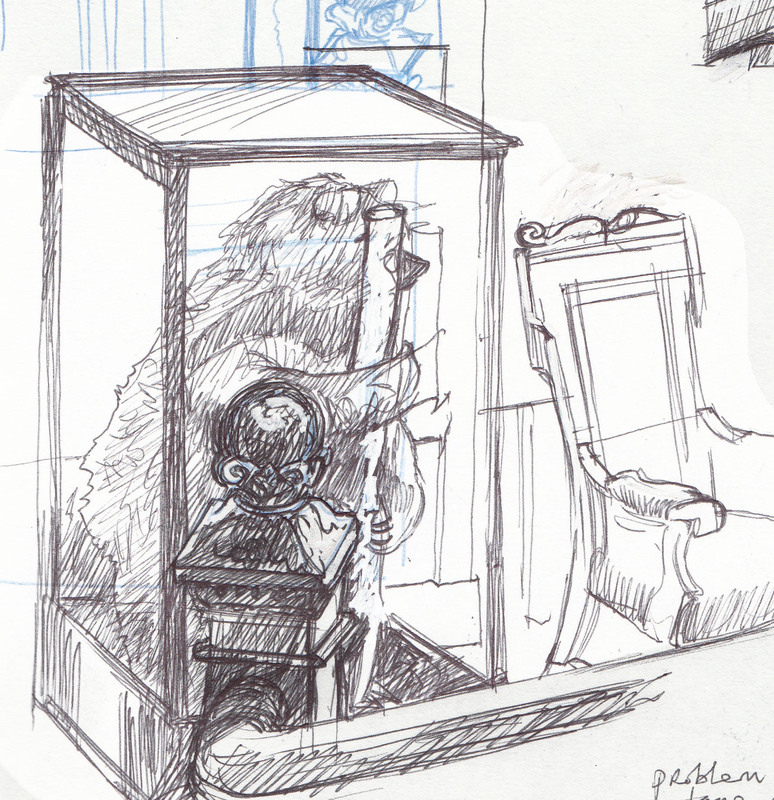 The bear sketch after a bit of flibberty-gibberting on my computer to lighten him and make him appear to recede away from the stair (how I should have drawn it). What excuse does one need to draw a Buffalo head? Right now I have to go…. but there’s more to follow so watch this space, another update soon (it’s been a while and I realise there is a fair bit of work since my last post, now I start to scan it all in and take stock!). 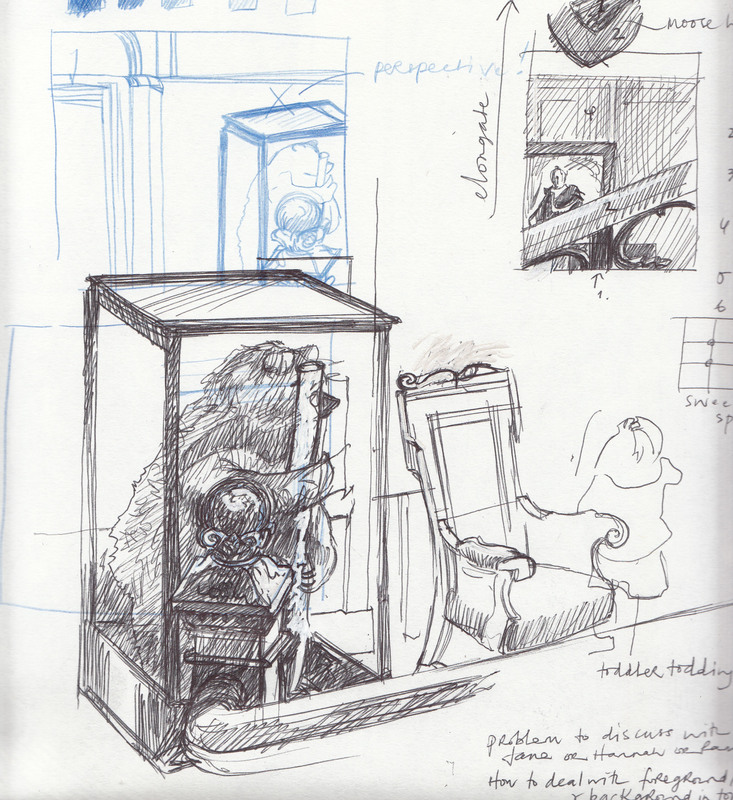 I like these, I like the idea of drawing in layers to give the activities that have occurred since beginning, how can you communicate the passing time? The bears are cool .. Thank you Carol. 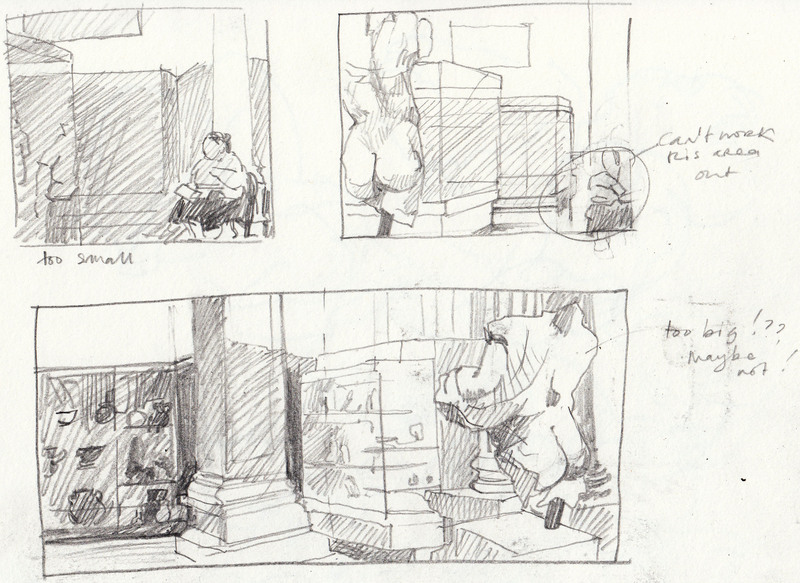 It’s such a nice thing to do, go draw in the museum. There are all these things to draw – but I am supposed to be drawing stuff that moves!